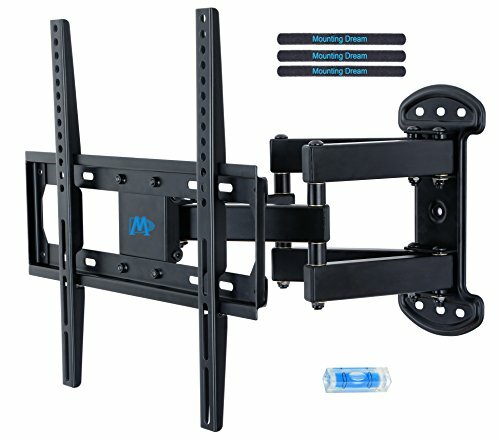 This mount fits most of 26-55" TVs sold today. It fits TVs with mounting holes as close as 3"X3" or as wide as 16"x16" (in TV terms - VESA 45x45mm to 400x400mm). Specifically, it fits VESA 75X75mm, 100X100mm, 200X100mm, 200X150mm, 200X200mm, 300X200mm, 300X300mm, 400X200mm, 400X300mm, 400X400mm. With articulating arm, this mount retracts to 3.2" (to wall) to save space, and extends up to 15.4" from the wall. Constructed with heavy duty steel materials with durable powder coated finish, this mount is 100% welded by automatic robot. This advanced welding technology makes the mount sturdy and ensures mounted TV stable and secure, supporting TV weight up to 99 lbs. This mount ships with hardware for both wall and TV mounting. This mount fits solid concrete wall/single wood stud installation.Please contact us for concrete anchors if needed. Caution:This mount is NOT for dry wall alone installatoin! This product is RoHS certified (European Union directive standard of Restriction of Hazardous Substance), aiming to protect human health and environment. Heavy duty unit for most 26-55" TVs up to 99 LBS, with max VESA 400 x 400mm and 4 times loading test. Detailed page will help you see if this mount fits your TV: VESA, wood stud location and possible blocked input. Not perfect? Pls check other MD mounts. Viewing becomes more comfortable: tilts TV up 5 and down 15 to reduce glare, swivels TVleft or rightaccording to your seats position. Pull out to 14 and retract back to 3, making your TV alive to move. Easy installation with decent instruction and all included hardware in pre-labeled bags. +/-3post-installation adjustment allows perfect TV leveling. Comes with Velcro cable ties and bubble level as gifts. US based customer support answers your pre-purchase and installation questions. Our mount is 10 year warranted!